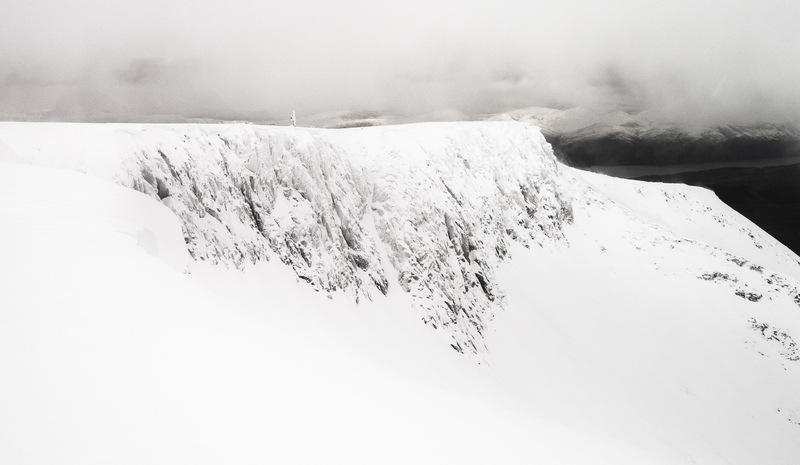 In the last week I have been working with several clients in the Cairngorms and Lochaber. There have been lots of fluctuations in temperature which has made for difficult working conditions at times. However much of the snow on the crags has consolidated down into névé and snow ice. 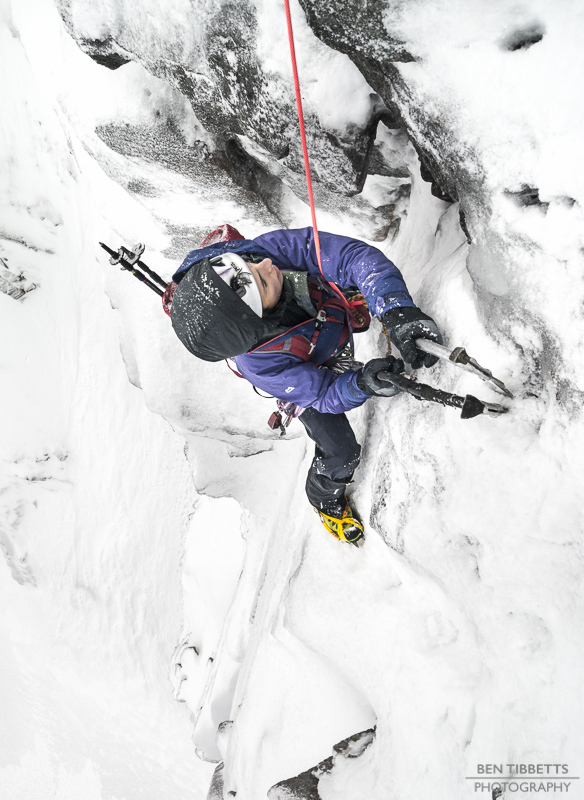 This, plus the climber compaction on some of the more popular routes in Coire an t-Sneachda, has bought some of these into very amenable conditions. On the 11th January I was out with Pam Van der Brug again. 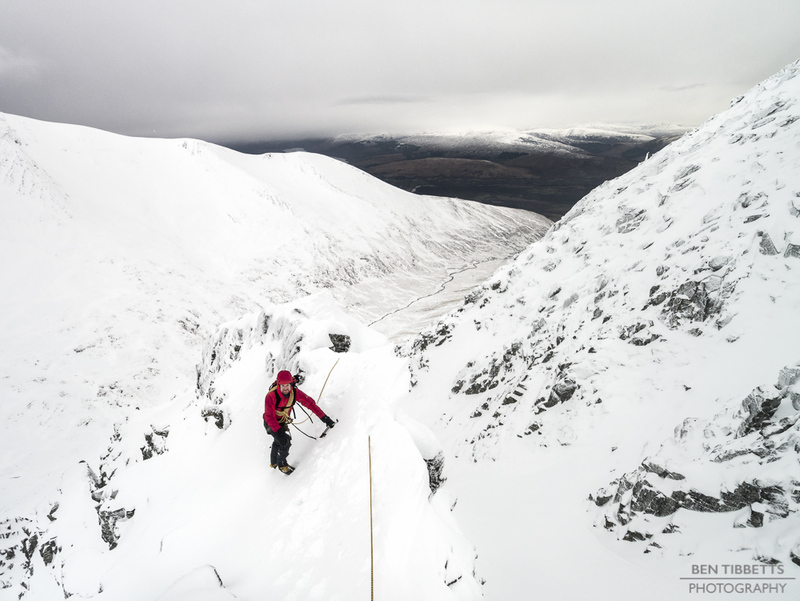 With a moderately early start we were the first party up into the Invernookie area of Fiacaill Buttress in Coire an t-Sneachda. This was only Pam’s second winter climb, after Spiral Gully Direct last weekend, so I thought Invernookie would be a good progression. However as she is a very capable rock climber, I gave her the option of The Seam, a slightly more technical route. It looked like someone had been up recently, nevertheless all the cracks and ledges were re-buried in snow so it made for slow going. As always though it provided a great sustained 40m pitch of moderate mixed climbing and Pam lapped up the challenge! 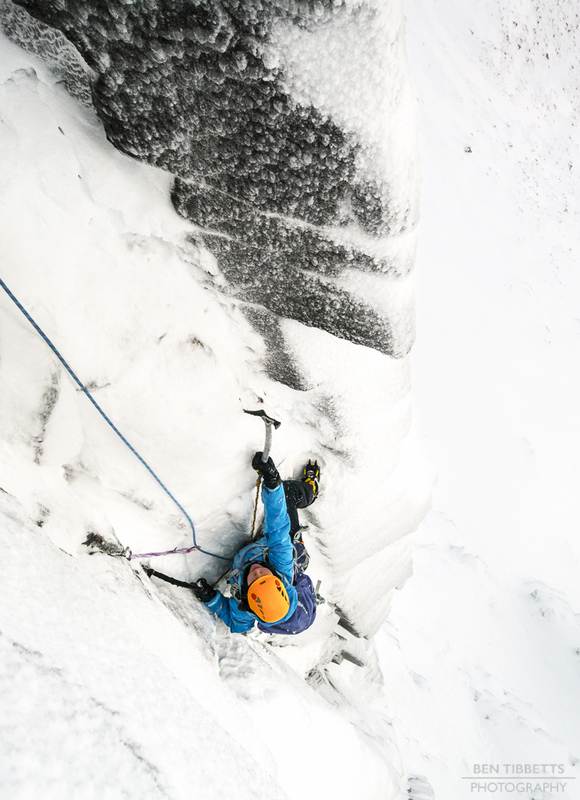 On the Sunday 12th January I headed over west to meet a client of Martin Moran’s, Toby Knight, for two days technical climbing. As he was lodged in the west we climbed over there. It had seen more recent snowfall over there, accompanied by strong west and south westerly winds meaning many of the good options were curtailed by avalanche risk. We thus headed into Aonach Mor’s West Face. We were hoping to catch the Gondola up Nevis Range, but it was closed due to high winds, so an easy day turned into a good solid hike to the base of the route. It had been over ten years since I last climbed Golden Oldy, a superb grade II rib. 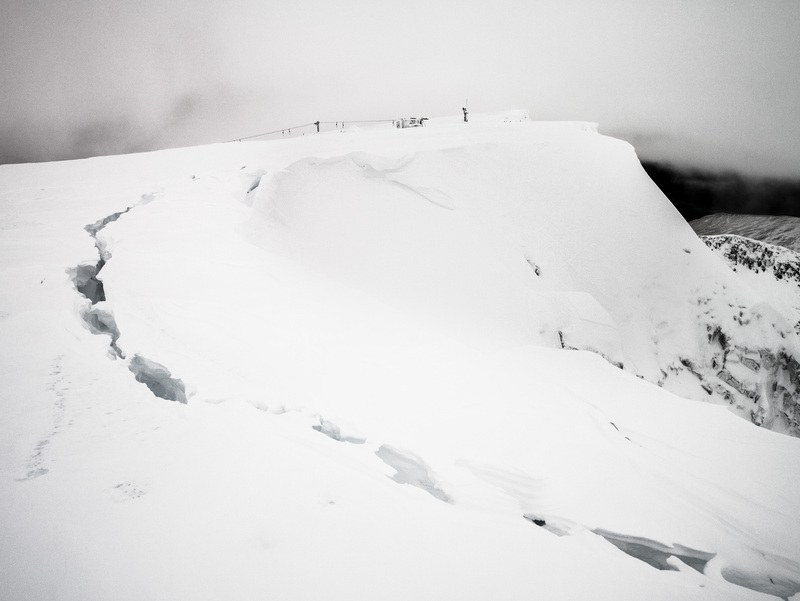 Conditions were as expected – the terrain had been wind scoured and was pleasant to climb. We moved quickly and despite the long walk up to start we got up the route and all the way back to the car before dark. On Monday 13th Toby and I set off up Ben Nevis to climb Tower Ridge. I hadn’t actually climbed it in winter myself and so was prepared for a bit of an adventure. The day started of fairly benignly, but after the first few hours the clag came down and the higher we got the more snow covered the ridge. I had hoped after a busy weekend with good weather that there would have been a track in and most belays would be uncovered. Not so. The wind had covered all traces if anyone had been before us. Toby Knight on Tower Ridge. 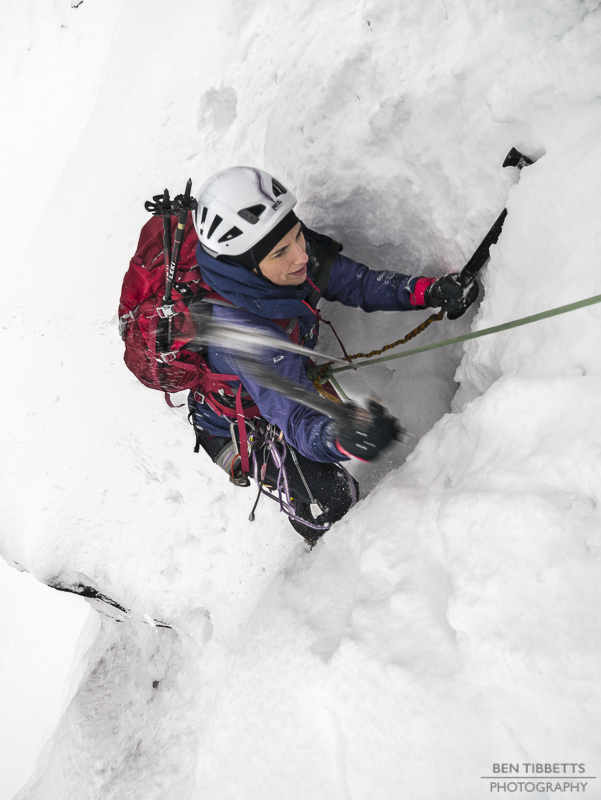 The snow had the most frustrating thick crust which didn’t support body weight, but also took a lot of effort to clear and find protection and belays. Higher still and progress slowed further, night fell and the snow was formed in strange wind flutings all over the buttresses. It was actually easier to find the way in the dark however, as a powerful headlamp pulled more contrast out of the snow formations than the whiteout daylight conditions. We eventually emerged at the summit at 10pm, both of us fairly brutalised by the experience but glad to be on the easy way down. On the descent the clouds parted to a gorgeous moonlit and star-filled night. 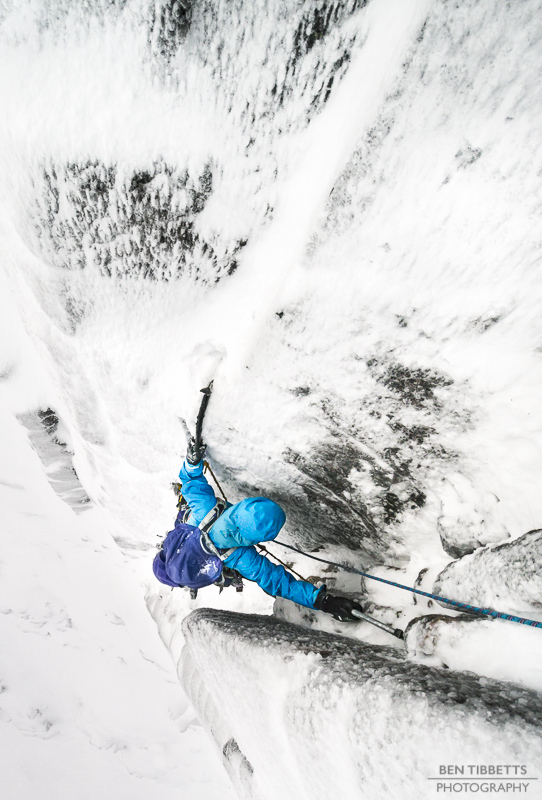 On Tuesday 14th Naomi Spencer arrived from London for her second chunk of winter climbing. 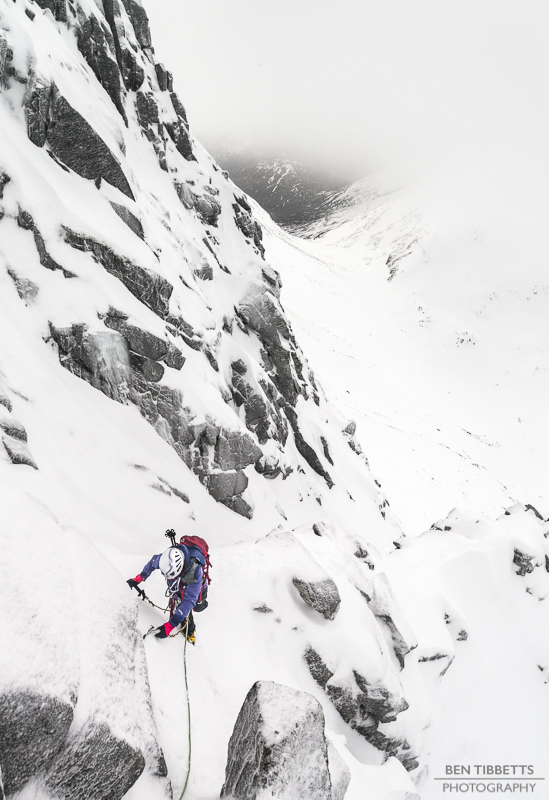 We headed into Coire an t-Sneachda for the first few days to do some technical climbing. The weather was overcast and windy as usual. Naomi Spencer smashing her way up the Haston Route on Mess of Potage. Wednesday was even more special with driving rain up to 900m. 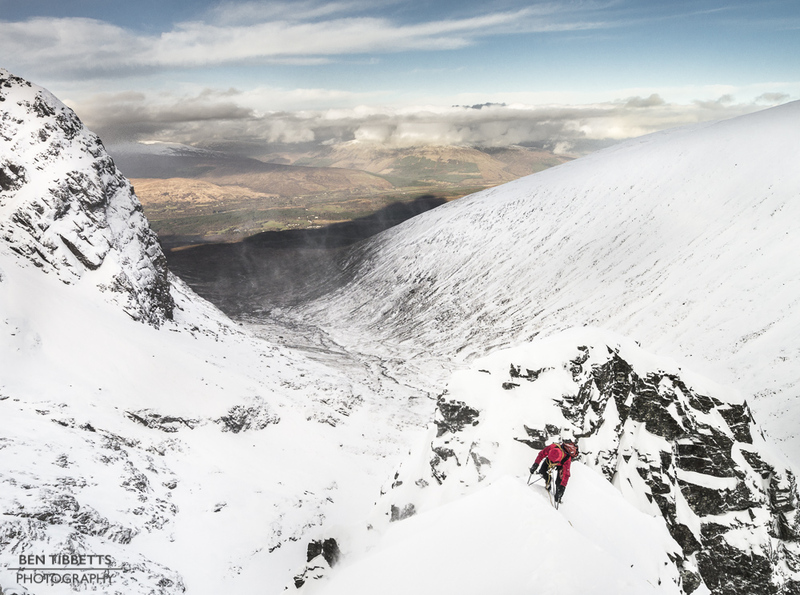 We scuttled into Fiacaill buttress to get some shelter and made rapid work of Invernookie. I didn’t even take my camera out, which is rare. As we were already soaked through it seemed a good opportunity to practice ice axe arrests. On Thursday we somehow snuck through the crowds onto Original Route on Aladdin’s Buttress, which was is stellar condition, then abseiled back down for another lap on Doctor’s Choice. On the Friday we finished the week off by a raid over to the west. This time we caught the 8am climbers Gondala up Aonach Mor, and skirting around to the West face again to go up Western Rib. The warm and wet weather on Wednesday has stripped some of the snow back and consolidated the rest. It still had excellent cover and we even enjoyed a short pitch of ice at the foot of the ridge.